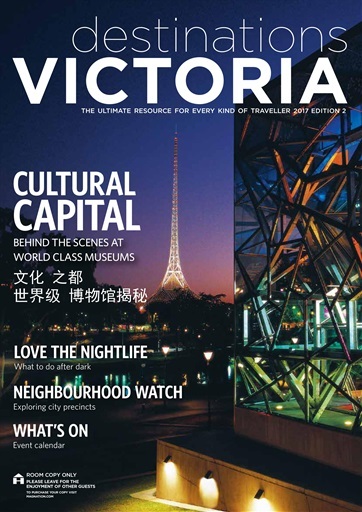 Destinations Victoria is the state's leading independent travel guide. In this issue, meet the curators behind some of Melbourne's most mind bending exhibits at the NGV, ACMI, Melbourne Museum and the Immigration Museum. 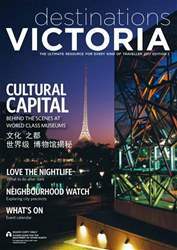 Explore Melbourne's unique neighbourhoods with our dedicated guide to the inner city, edgy north, burgeoning west, leafy east and beautiful bayside suburbs, plus tips from local legends including restauranteur extraordinaire Neil Perry, retail queen Mary Poulakis, hot air balloon pilot Brian Garth and nature guide Jeanine Duffy. Finally, our extended regional coverage includes tempting experiences, restaurants and road trips from the Grampians to the Goldfields, Daylesford to the High Country, Phillip Island to Mornington Peninsula. Come away with us.